Your Autumn/Winter 2018 guide to living, working, visiting and playing in Paddington. 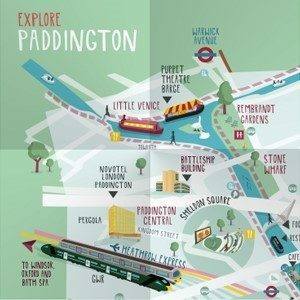 Discover all Paddington has to offer with your illustrated map. The Paddington Partnership invites submissions from artists, architects and graphic artists to address severance and create a thread of common identity. An egg-cellent Easter is in store at Merchant Square this bank holiday weekend, with free film screenings, egg hunts and discounts to enjoy. The perfect Easter holiday family day out, pack a picnic and find eggs between Paddington and Camden. A summer of brick-building fun awaits at Paddington Central, where the Mini-Engineers LEGO iLab will be running workshops, holiday camps and parties. View development proposals for 40 Eastbourne Terrace, Paddington, at an exhibition hosted by owners YardNine. Unlimited yoga and state-of-the-art equipment await at St Mary’s Hospital, Paddington. Paddington Covers is for Pop and Rock music lovers throughout the ages, from hippies to hipsters, completely unique and you can’t help but love it. Public Meeting, Tuesday 26 February, 6.30 p.m.
Do you live or work in the Paddington area? Join fellow residents and businesses at this public meeting on 26 February. British Land is bringing forward proposals for the final plot of the Paddington Central development. GoBoat London is back open for business in Paddington's Merchant Square. A new menu of tasty lunchtime treats has arrived at Merchant Square, with a tempting selection of street food on offer. A hearty Paddington local since 1852. Coffee, breakfast, brunch or lunch, walks, talks or a secret gawp at someone you like, here’s how to spend a whole day in and around Paddington. The best places to pig out in Paddington in the Year of the Pig. Deliciously healthy, homemade, wholesome, ethically produced, chemical free food. Get your fitness fix in Paddington, 9 of our fitness picks for 2019. The Paddington Partnership will only use the information you provide on this form to send you The Paddington Partnership company or community e-newsletter. If you are new to the Community Programme we may also send you a welcome email to introduce you to the services we offer. If you decide you no longer wish to receive the newsletters, you can unsubscribe at any time by clicking the unsubscribe link at the bottom of any e-newsletter you receive from us, or by contacting us on [email protected]. The Paddington Partnership: 7 Praed Street, London, W2 1NJ.